Incorrect guardian for your children: A will is a way for you to control what happens to your estate and your minor or disabled children from the grave. If you fail to put together a will, the state will decide who cares for them at a court hearing. If you do have a will, be sure to review it regularly and confirm your original guardian is still a great choice for your children. If he or she is not, then amend your will and choose another guardian. Since all family law judges are required to make decisions in the “best interest of the child”, it can be a good idea to write a letter of explanation to help the judge understand the decision you’ve made. Wrong beneficiary for your 401(k), IRA, or other accounts: This is a common mistake that can be easily fixed. For example, a single parent may list his or her grandparents as beneficiaries, intending for the grandparent to use the funds for the minor children but fail to change it when the child reaches the age of majority. Or, couples who divorce forget to change the beneficiary information on their plans even after the case is settled. Beneficiary accounts like 401(k)s and IRAs, among others, bypass probate – the official administration of a will through court supervision. While this is typically an advantage, if the beneficiaries listed are wrong it may not be able to be fixed – or can be fixed but will require expensive litigation. This is why it is crucial that you periodically review your designations and confirm you have the right beneficiaries in place. Your property is titled as joint tenancy: It is important to understand that joint tenancy is not necessarily the best way to title your real estate or bank accounts. Joint tenancy can unintentionally disinherit heirs because the right of survivorship causes the property to pass outside of the deceased’s estate. It can also cause income tax problems when real estate is sold if the real estate has greatly appreciated since it was originally purchased. Joint tenancy can also cause creditor issues. Even if you are not at fault, a judgment against one of the joint owners could cause a sale of real estate or a creditor cleaning out a bank account. You do not have enough life insurance: When an untimely death happens, the first question is whether or not the deceased had life insurance. Studies show that more than half of widows and widowers who collected life insurance proceeds received less than one year’s worth of income. In short, check your life insurance coverage and make sure that the amount is appropriate for your family’s needs. debts. In short, there is no way to keep your medical, legal, and financial life in order unless you have a valid, durable POA. The absence of a POA means your family will now have to petition the court to appoint someone to handle your affairs and this can be a very costly, time consuming and public process. Bottom line: Remember, after you are deceased or incapacitated, it is too late to fix many estate planning problems. Poor estate planning can not only have results that go against your wishes but can also have dire consequences for your heirs. Consult with us as your knowledgeable estate planning attorney. 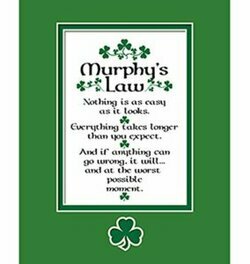 We’ll help your family break Murphy’s Law by developing a plan that fully protects your family.